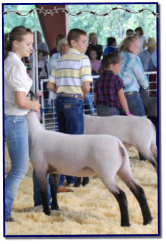 Linn County Fair Livestock Auction Benefits Local Youth by Janell Aust Linn County 4-H and FFA youth work hard throughout the year to raise their top quality livestock. They also have an opportunity to sell their animal at the end of the fair, which many use the money as an avenue to help with college expenses or future livestock purchases. The annual livestock auction of the Linn County Fair will be held on Saturday at the end of the fair at the fairgrounds. While the auction has had great support from area businesses and individuals in the past, there is always room for more buyers. "Having a variety of buyers participate in the auction is the key to success and out livestock numbers continue to increase," says Austin Stroup, Linn County Fair Livestock Auction Chairman. "It's that buyer support that makes this all work. Whether they are buying the livestock for actual consumption or just paying the premiums, the money earned through the livestock auction provides a great financial boost for these kids." For business owners, it's a great opportunity to get their name in front of a wide-ranging audience of current and potential customers. Individuals and families also are among the many that have always supported the auction and while it's a charitable donation, there is also the feel-good factor of knowing they are helping the next generation. It's an easy process to participate; buyers are sent a bidder number prior to the auction or they can register that day. Once a purchase is made, buyers have the option to either have the animal processed; paying for the animal (by weight) and the premium or just pay the premium if they choose not to receive the end product and it will be processed and sold. Either way the money for the animal and the premium are dispersed to the seller. Buyers and sellers are invited arrive early for a breakfast (7:00-9:00am) hosted by the United Methodist Women of Mound City. Additionally, lunch sponsored by “Friends of 4-H” will be provided to buyers and sellers following the auction. There also will be an opportunity to have photos taken with the kids and their buyers. 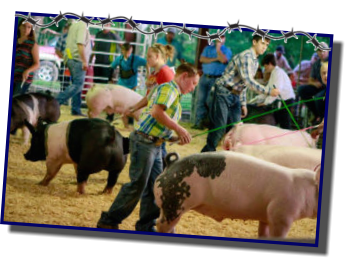 For more information about the Linn County Fair Livestock Auction, go to www.maraisdescygnes.k-state.edu/fair/linn- county-fair or contact Austin Stroup (913) 259-0261. 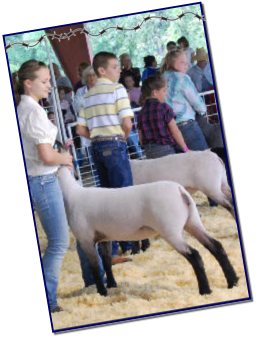 Linn County Fair Livestock Auction Benefits Local Youth by Janell Aust Linn County 4-H and FFA youth work hard throughout the year to raise their top quality livestock. 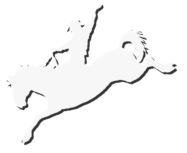 They also have an opportunity to sell their animal at the end of the fair, which many use the money as an avenue to help with college expenses or future livestock purchases. 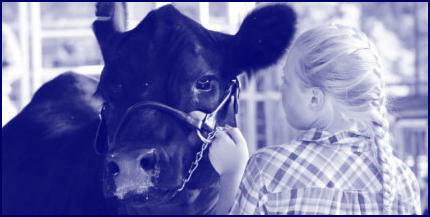 The annual livestock auction of the Linn County Fair will be held on Saturday at the end of the fair at the fairgrounds. While the auction has had great support from area businesses and individuals in the past, there is always room for more buyers. "Having a variety of buyers participate in the auction is the key to success and out livestock numbers continue to increase," says Austin Stroup, Linn County Fair Livestock Auction Chairman. "It's that buyer support that makes this all work. Whether they are buying the livestock for actual consumption or just paying the premiums, the money earned through the livestock auction provides a great financial boost for these kids." For business owners, it's a great opportunity to get their name in front of a wide-ranging audience of current and potential customers. Individuals and families also are among the many that have always supported the auction and while it's a charitable donation, there is also the feel- good factor of knowing they are helping the next generation. It's an easy process to participate; buyers are sent a bidder number prior to the auction or they can register that day. Once a purchase is made, buyers have the option to either have the animal processed; paying for the animal (by weight) and the premium or just pay the premium if they choose not to receive the end product and it will be processed and sold. Either way the money for the animal and the premium are dispersed to the seller. Buyers and sellers are invited arrive early for a breakfast (7:00-9:00am) hosted by the United Methodist Women of Mound City. Additionally, lunch sponsored by “Friends of 4-H” will be provided to buyers and sellers following the auction. There also will be an opportunity to have photos taken with the kids and their buyers. 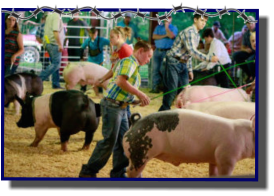 For more information about the Linn County Fair Livestock Auction, go to www.maraisdescygnes.k-state.edu/fair/linn-county-fair or contact Austin Stroup (913) 259-0261.